One of the best things about my house is that it’s barely been touched renovation-wise in the 78 years since it was built. With the exception of the kitchen floor and a respectful bedroom addition that was done in the 1950s, pretty much everything is original to the house. My landlord—a lover of old houses—bought it from the original owners, and he’s really done the bare minimum in terms of updates since then. 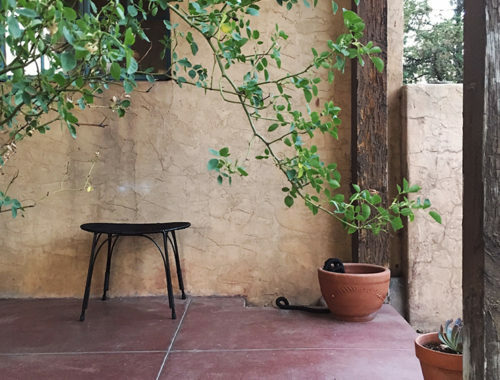 The lack of contemporary updates was the primary thing that drew me to the house, even though I was aware that I’d have to put in a fair amount of labor to get the place to really shine and look its best. 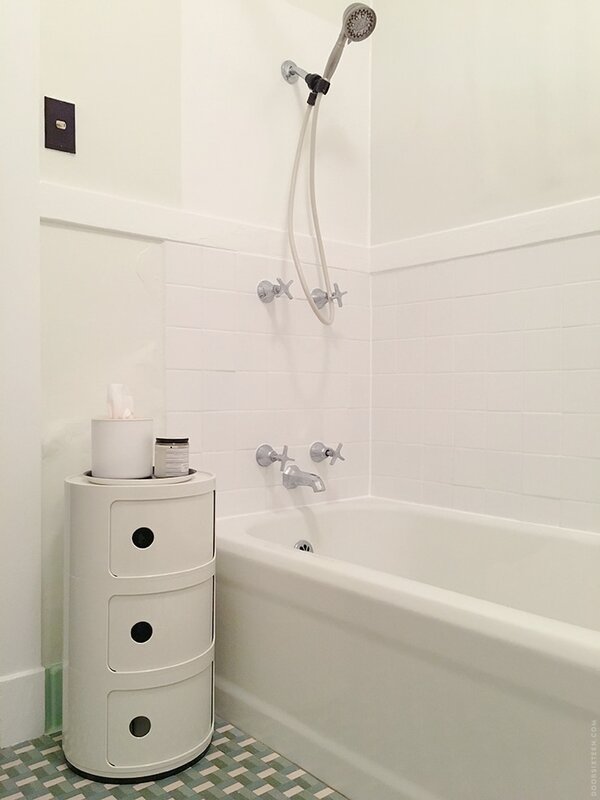 I posted a few sneak-peek photos of the full bathroom (there’s also a smaller 3/4 bath—more on that in a future post) months ago, and since then, I’ve clocked a lot of hours working in there. It’s still not done-done, but it looks a helluva lot better than it did. The first things to go were the four sets of grab bars. Maybe someday I’ll need them, but not yet—so they’re now stored in the basement in case my landlord ever wants to reinstall them. (Somewhat horrifyingly, they hadn’t been mounted to studs! They were just screwed into plastic anchors. Yikes.) As you can see in first photo in this post, the walls were pretty messed up just from pulling those anchors out. A lot of the paint around the sink was lifting and peeling badly, too, so I did a bunch of scraping in preparation for patching and skim-coating. According to the blueprints (which my landlord found inside the basement ceiling! ), the tub surround walls were originally finished not with tile but with something called Keene’s cement. Keene’s cement (which is still available) is gypsum plaster with alum, and it dries to a super-hard finish that’s water-resistant. It’s not impenetrable, though, and if it gets damaged or isn’t properly maintained, it can fail. I’m assuming that’s what led to someone adding 4×4 tiling around the tub, and while I actually think that was probably the best choice tile-wise, they didn’t do the most professional job—note the lack of proper edging pieces, for example. Side note: If you’re the curious type, I suggest reading the Wikipedia article about Richard Wynn Keene, better known as Dykwynkyn, the inventor of Keene’s cement. Fascinating stuff. Aside from the cruddy tiles (and the peeling paint on the wall above the tiles), there’s a painted wood chair rail that runs around the perimeter of the whole bathroom, and it’s seen better days. If I owned this house, I’d most likely cut the wood out of the tub area and re-do the tile to full shower height. But I don’t, so my plan was to tune up the fixtures (which are original, with the exception of the handheld showerhead), regrout, recaulk, and of course scrape, patch, and seal up the walls as best as possible. 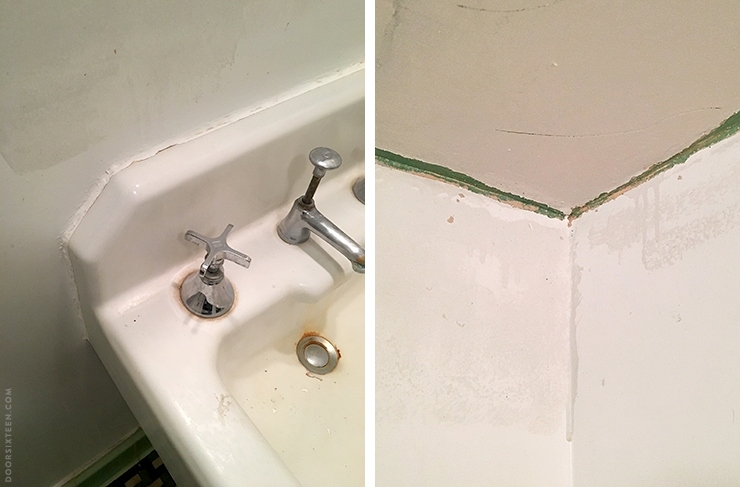 These photos give an idea of what I was dealing with all over the bathroom—sloppy caulking galore, and layers of paint that had shrunken to the point of separating from the corners where the walls and ceiling meet. It was a mess. But hey, check out the original color of the upper walls! That green is really…something. As much as I like historic restoration in concept, there’s a line I draw when it comes to paint colors. I just can’t get behind painting a bathroom nighttime-at-the-hospital-morgue-green, even if it was all the rage in 1939. I feel pretty happy about this side-by-side. The built-in cabinet was seriously gross, and every day I got skeeved out putting my toiletries in there, despite having scrubbed it down with bleach. 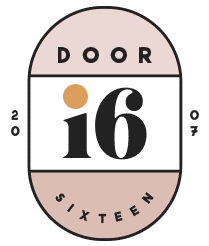 I hadn’t intended to leave the (totally nondescript) door off, but once it was repainted it looked super cute as open shelving, so…we’ll see. I like the idea of just having pretty items like perfume bottles and little plants and books on display, but the reality is that I’m a product whore and I don’t own a fancy hairbrush and I’m not going to decant my vitamins into mason jars, so I might need to put the door back at some point. If I do, I’ll make sure I get a cute knob for it, I promise. 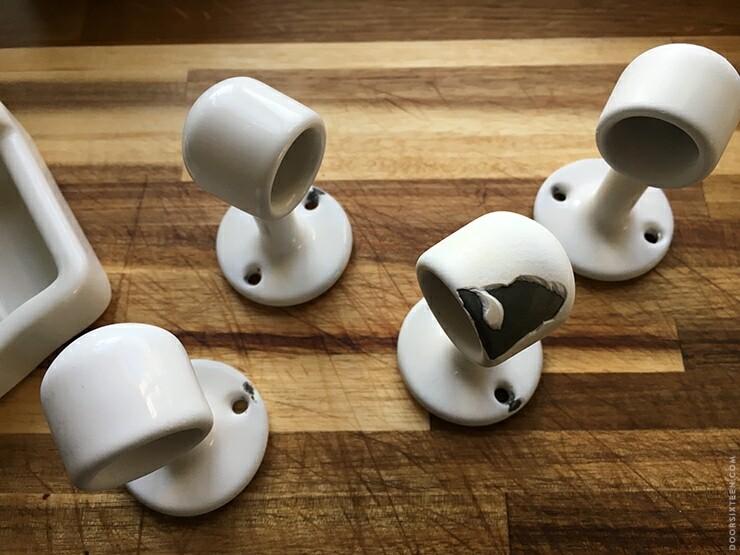 Happily, the original towel rods with their beautiful enameled iron brackets had never been removed, but they did have a ton of paint caked on them. I was able to soak all of the paint off in hot water (à la the crockpot method) with very little effort. Unfortunately this revealed several large chips in the enamel. At first I thought I’d just leave it be and live with the imperfections, but once they were mounted on the wall they kind of just looked…well, bad, so I touched up the chips with a few coats of white nail polish, and they look excellent now. I thought I had taken pictures while I was doing that, but I guess not? Use your imagination. Or don’t bother, because it’s not that exciting. Yes, this house still has its original electric, including horizontal Bakelite toggle switches and faceplates. Most of the faceplates have been painted white, and I’m OK with that—I find it curious that they were originally brown, since the switches themselves are ivory. 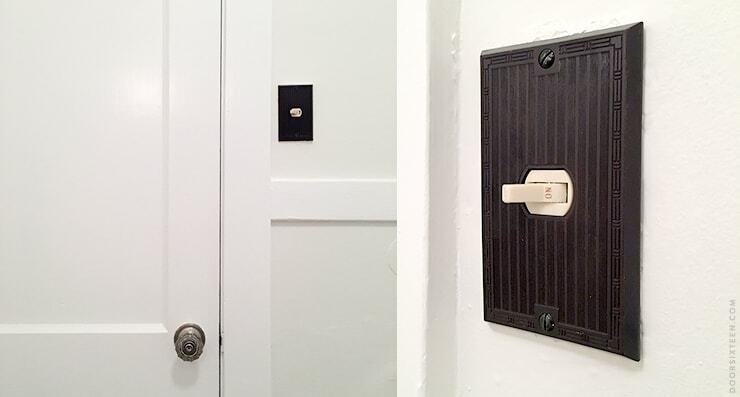 I don’t know if contrasting switches/plates was a trend once upon a time, but it’s consistent throughout the house. I thought it might be nice to have a brown one in the bathroom, though, so I found one on a switch the basement that had never been painted and swapped them. Ahhh, vintage Kohler love! 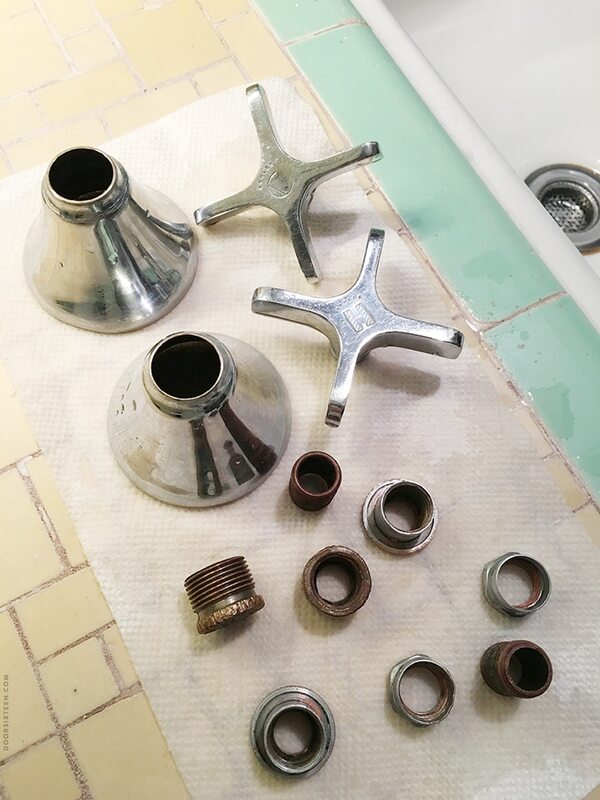 I took the faucet handles apart, soaked all of the parts in vinegar, and they looked just about new again after a couple of hours. Glorious. The sink had been dripping pretty badly for who knows how long, and in preparation for fixing it I had about 40 types of washers on hand—and, of course, none of them fit. So I made my own washer, because that’s the kind of girl I am. Then I put the whole thing back together, and IT WORKS (that’s a video, in case you’re not sure what running water looks like)! But now it’s dripping again four months later, so I’m going to replace the washer again now that I have a factory-made one that’s the right size. Regrouted! Recaulked! Repainted! Man, this shower feels a million times better now. It’s hard to tell, but I painted the area in the shower above the chair rail with glossy trim paint instead of flat wall paint. I figured that will give it at least a little bit more protection from water. So far, it’s holding up nicely. Oh, I wrote a post a few years ago about dealing with nasty grout and caulk, if you need some tips. Recaulking bathtubs is seriously one of my favorite things to do. I even recaulked Evan’s bathtub the last time I was in Brooklyn—and if that’s not me being the best ex-wife in the world, then I don’t know what is. I’m really happy to have a Componibili again! The one I bought years ago for $29 still lives in New York, and I’ve been missing it. Unfortunately I had to pay full price this time, but it’s worth it. They’re really perfect for bathroom storage. One section holds four rolls of toilet paper, another is for my hair dryer and straightening iron, and the third has epsom salts and various other bath sundries. I’ve never used the word “sundries” before. It sounds nice. Speaking of baths, it’s really good to feel like I can take a bath again. I’m kind of picky about tubs, probably because I got spoiled by the clawfoot tub in Newburgh. I like cast iron tubs, and I need them to be deep. I also can’t handle looking at any mildew or other grossness while I’m soaking. I just can’t. So yes, this feels very good. So this is where I’m at! The walls have been repaired and repainted—that’s Valspar Paramount White with Du Jour on the trim (HUGE thanks to Lowe’s for the paint!! )—there’s a new toilet seat, the plumbing is nice and tight, the window got a coat of black paint, and the whole thing is looking good and clean and fresh. 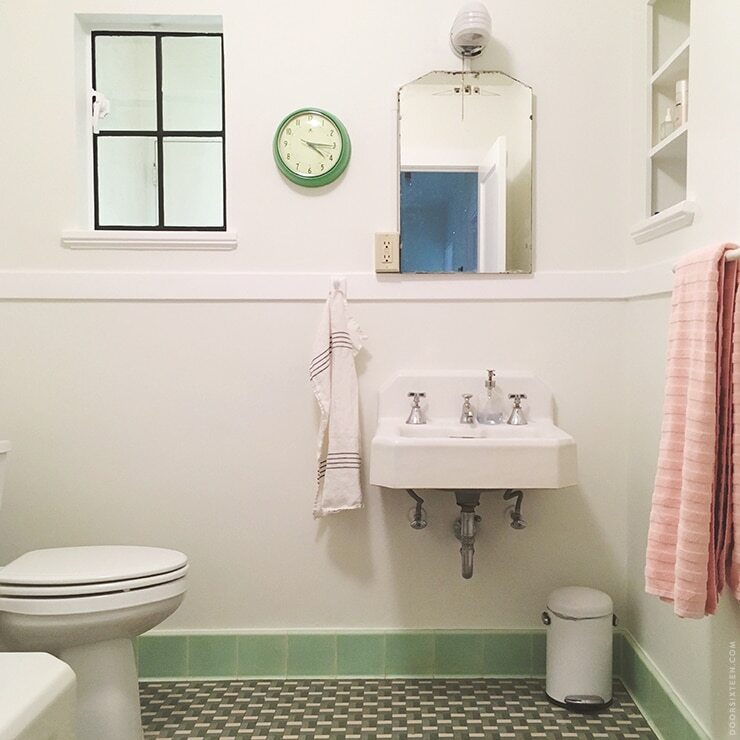 The cute little trash can is from Simple Human, the fakey-vintage clock is from Infinity Instruments, and the pink towels are from H&M. I’m still thinking about maybe putting up this gorgeous banana leaf-print removable wallpaper from Walls Need Love on the lower half of the walls, but I need to live with the white space for a while. I’ve also considered putting up some beadboard? I’m not sure. I need to get some plants and stuff in there and see. Right now I’m really enjoying how soft and serene it is, but I’m also kinda itching for some bold pattern. Maybe that should happen with the shower curtain instead? Hmmmm. you’ve been up to all this time. It was sure worth the wait! A fabulous job. Congratulations on the product of all your hard work. You keep saying “if I owned this house, I would…” I think maybe you need to make a list of those things and show it to your landlord. If he loves old houses, he might love the suggestions to make his old house even better! Maybe he would even cover supplies and pay you a wage for labor if he didn’t have to do anything thinking besides saying “yes”. Of course for you it would be like a 3rd job? But it’s oneyou are almost doing anyway? That’s not really something I WANT to do in a house I don’t own—it’s not about him not OK’ing it. There’s not really anything in it for him, anyway, unless he decides to sell the house—which obviously isn’t something I want to have happen! This post was a great start to my Monday morning! I really love what you’ve done with the space, it’s especially refreshing to see what a renter can do to transform something. That green tile is so gorgeous, you have me feeling very envious of it! I have such bathroom envy right now. You’ve done a marvelous job. That’s nice to hear, Beth, thank you! I’m so happy that you’re back to blogging for now, Anna. Seeing that you’ve posted something new is like finding a VegNews in the mailbox…always fun to read! The bathroom looks so, so great (your office does, too!) Can’t wait to see other areas of your house as you improve them. Ooooh, I really like that, Sarah! Thank you for linking to it! Ahhh I ordered that for my own 1930s bathroom thinking it was perfect and… not. 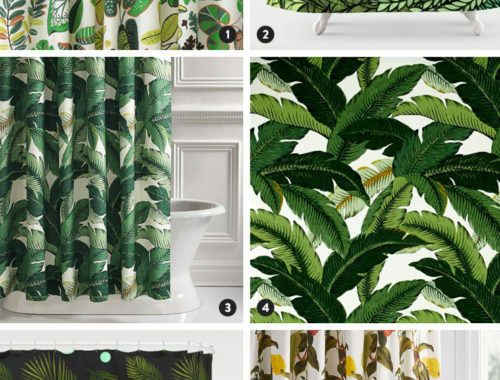 Still on the hunt for the perfect jungle bath curtain. May it work for you! Oh no! What’s wrong with it, if you don’t mind me asking? these PJs are outta my price range – but a girl can dream can’t she? Does the bathroom window open to another room (the 1950’s addition, maybe) or is that a reflection? It opens to a small mudroom between the kitchen and the back porch (it’s the area behind the glass kitchen door in this post), so it still gets a bit of natural light via the kitchen. If I owned the house, I’d replace the solid back door (which was added at some point, probably for the sake of insulation—the kitchen door used to open directly to the outside) with a glass door to increase the natural light in the bathroom. Wow, Anna. This is amazing! I hope you’ve had a good long soak with wine and candles already. You deserve it. Have you used removable wallpaper around fixtures in bathrooms before? I am seriously tempted to put some up on the back wall of our approx. 5′ x 5′ powder room, but the sink (IKEA Ånn) and toilet are both on that wall, which means lots of plumbing cutouts, and I’m nervous. I can’t figure out whether it’s easier or harder to deal with than traditional wallpaper (which I’ve also not worked with). Judi, I’ve never used removable wallpaper at all! I’ve used traditional wallpaper many times, but even when put it up in a bathroom, it was only on the top half of the wall (above the fixtures, etc.). That said, I imagine making a paper template first would make things MUCH easier. However…MaryMargaret’s comment below is giving me pause. Scroll down and see what she has to say! Oh my god, what a difference! I moved into my rental about 5 years ago, and the bathroom was a nightmare. The window was totally dilapidated and there were large gaps in the casings where you could see straight to the outside. Everything was cracked and peeling, the cast iron sink was pulling away from the wall, the shelves in the medicine cabinet were falling down, and so on. The light fixture was a halogen monstrosity literally attached to a raw 2×4 screwed into the wall! Your’e the one who inspired me to try to fix it up. I used tons of wood putty and caulk to plug up the gaps in the windows, sealed cracks in the walls and ceiling, and painted everything. And we got a new sink, medicine cabinet and light (which are landlord did pay for). It’s the first time I’d ever done work like that, and admittedly my results were not even remotely as nice as yours. But it’s better! 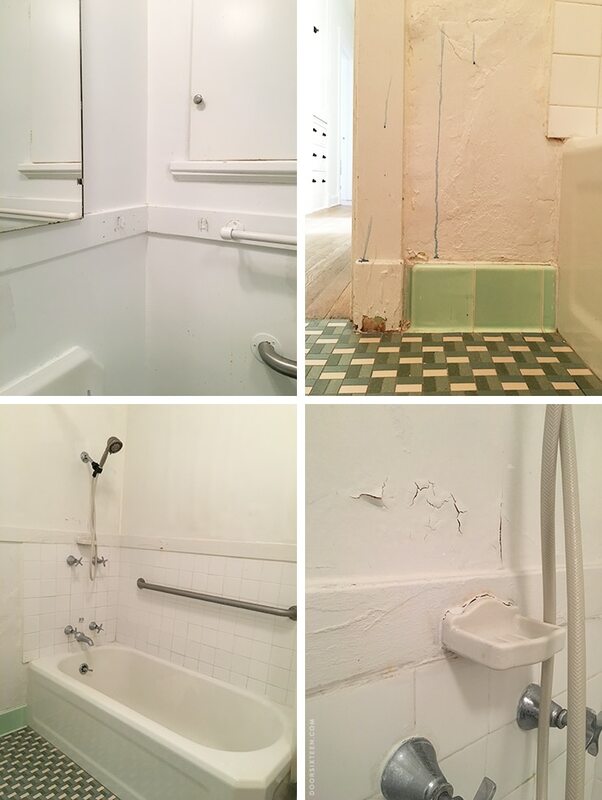 If not for you sharing your rental updates (in your Brooklyn apartments), I wouldn’t have dreamed of undertaking the work, and would still be living with a total hellhole bathroom, instead of a mildly distressing one. That makes a difference to my everyday sense of well-being, so thank you for the inspiration! Ah, Jen, it makes me SUPER HAPPY to know that I had a hand in inspiring you to make your home more livable! 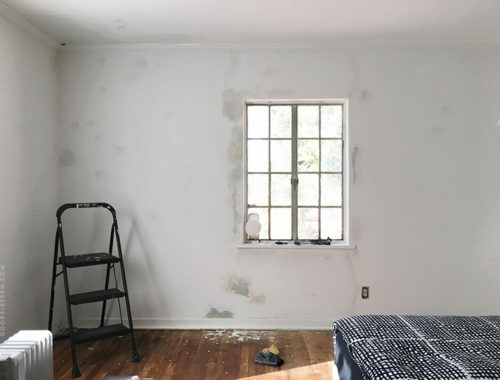 Nobody should feel like they can’t make improvements within their budget even if they’re a renter—and it’s extra great that your landlord was willing to get on board, too. Gorgeous. I would get a crazy shower curtain and skip the temporary wallpaper (or go with the real paste-on deal). 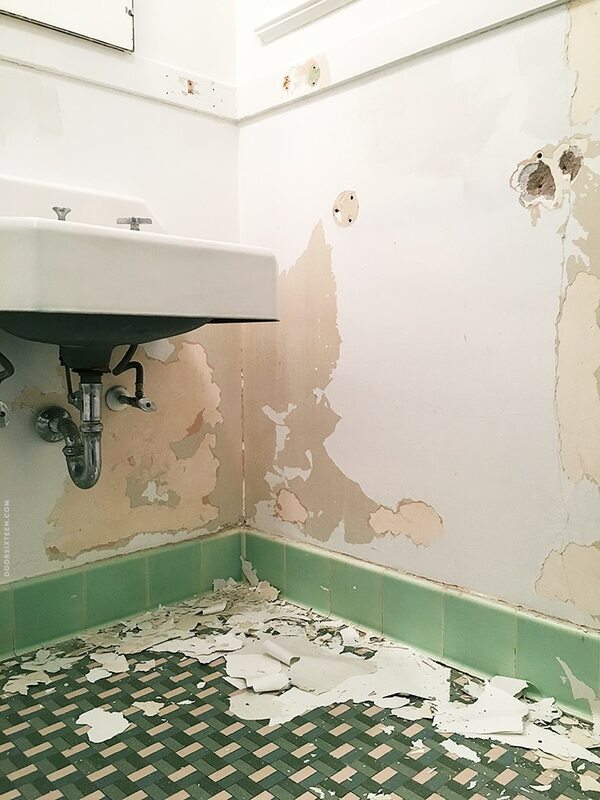 The temporary wallpaper we put up in a powder room is already peeling at the seams (resulting in some add-on adhesive from us, thus defeating the temporary nature…). It looks fantastic, but unfortunately is requiring upkeep that I did not anticipate AND it’s not even in a room with a shower. Plus, it gets a ding from my installer, who did a fantastic job, but complained that it was harder to work with than the paste-on variety as it could not be “scootched” over while wet for a perfect alignment. Any mistakes with the temporary paper had to be entirely peeled off, then reapplied. Your mileage may vary, of course. Love the green floor and hooray for a perfect soaking tub with no surrounding ick. Truly lovely! Fantastic job — your landlord must be head over heels in love with a renter like you. Thank you very much for sharing your experience with removable wallpaper!! To be honest I’m kind of worried about putting any non-waterproof wallpaper on the lower half of the wall, because I do tend to splash a lot when I’m washing my face. I hadn’t even considered the added difficultly of using adhesive paper, but your installer makes a great point. A lot to think about before I invest time/money. Thanks!! 1. I keep hearing the theme song from “Amélie” and wondering when a tile will pop off to reveal a hidden stash. 2. Your landlord is undoubtedly thanking his lucky stars that he got you. Seriously. He’s at the local café with his buddies, and they are all complaining about their awful tenants, who don’t pay on time and who trash the place, and then he says, “my tenant just renovated the bathroom.” It’s like winning the lottery for him. Ahhh! This post is everything I love about your blog! And yes, best ex-wife ever…. 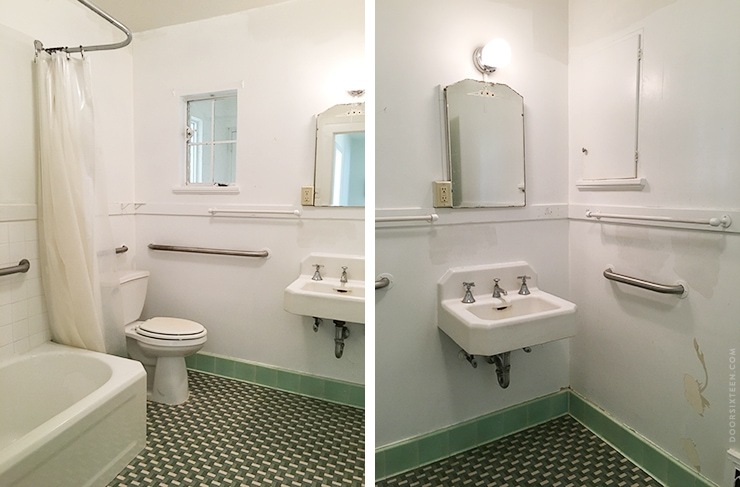 I love this so much…One of the things that pains me the most to read on design blogs is posts where lovely vintage/original bathrooms in older houses get completely torn out and replaced. Wow, Anna! That looks so great. (Also I thinking making your own washer deserves some sort of hero cookie.) It’s always satisfying to see you take something kinda janky and restore it to its rightful gorgeousness. And such a pleasure to see your posts. I am so happy to see you back! I was so excited when you moved into this place. I currently own a 1938 Spanish bungalow and was dying to see what you’d do with it. But funny enough on timing, we’re selling next month. But, my question! I’d love to know if you were able to tackle the rust on the sink, and if so, how. We replaced the fixtures on our sink, and the footprint of the new knob is smaller, and the rust rings are horrible. thanks! Good to read you again Anna. This looks great! Fantastic job on the bathroom redo. But what I really want to know is – what do you listen to while doing all that work? Usually whatever’s on WNYC, but sometimes I’ll use the time to catch up on episodes of shows I’ve missed (The Moth, This American Life, Here’s The Thing, etc.). I’ve also been trying out audiobooks lately. Gorgeous update as always. I’m curious what you think of the H&M towels, after being very disappointed in the quality and texture of Nate Berkus for Target towels I am weary of trying other inexpensive brands, by I love the look of those! Joanna, yes, I love the towels. They’re very plush and kinda luxurious-feeling, like hotel towels. I’ve had mine since November or December, and I wash them weekly—so far, no loose threads or fading. I’m definitely planning to get another set in a different color for my other bathroom! Wow what a great job. Have missed your posts so glad you are back. Agree with the others – your landlord must be ectastic. Is he at least reimbursing you for materials since you are doing the labor? Hope so. No, the things I’m doing are all my own choice. I don’t think it’s right to ask a landlord for reimbursement unless it’s a condition of the lease. Thanks! And it’s so good to see these new posts, though I totally understand the need for a break, too. Love the work in here! Where did you get the tissue holder? I’m amazed. Well done, you. 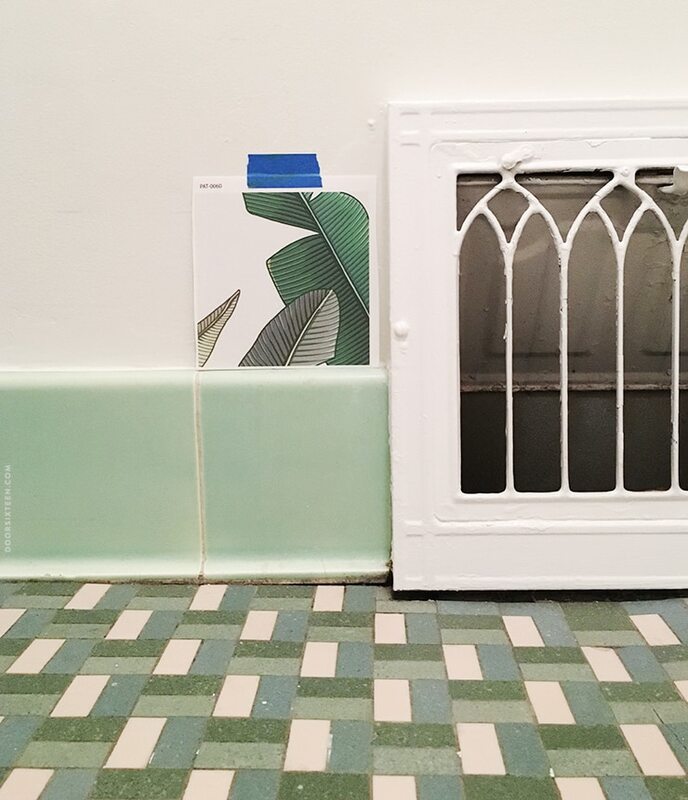 Anna, I have the same green wall and shower tiles and I love them, and I love this post for how you have brought the green out and highlighted it. So pretty. The former owners of my house put down a terrible brown floor instead of the great one you have, so I have a poop brown tile floor, which I am trying to figure out what to do with…. oh and that wallpaper got me excited!!!! but I worry about peeling and humidity…. This is providing such good inspiration – thank you. Any thoughts about a good modern floor choice to go with the green (which is in fantastci shape)?? I really want to replace the brown, and get a better look like the tile you have or something that really makes things pop. If you were replacing that floor what would you go with? I’m seriously considering putting bead board up in our bathroom, but I’m not too crazy about that panelling stuff with pretend grooves. Is there a better option? We live in a two horse town with limited selection, but I go into town regularly enough. Tara, do you have access to Lowe’s or Home Depot? They both carry real tongue-and-groove beadboard planks. Most lumber yards should have it, too. YOU are amazing! I’m so glad I checked out your blog today and found you’ve started posting again. Such a lucky landlord to have you! I, at 29, read your posts about upgrading your bathroom with the same enthusiasm as I, at 15, would read a brand new Harry Potter book. Love that original flooring, it looks like it’s in very good shape. I restored a ’42 house in San Diego and struggled with those painted-with-a-zillion-layers heater vent covers. I took them out, sent them to a professional paint stripper and then spray painted on my own. I wound up being pretty cheap considering I did not have to deal with nasty chemicals. If you do this, be prepared to repaint immediately – they start rusting quickly. I also had the same dilemma with the paint color – my tiles were purple. I wound up using a contrasting color, in my case lime green and lots of white. Your landlord is a very lucky guy and you are awesome working on this old place with respect. FYI, a great way to deal with vent covers like these is to have them sandblasted and powder coated. If you’re doing a bunch at once, it’s pretty cheap! I just wondered if you managed to find a towel dryer to compliment them ? If so, from where ?